O2019-01 01/16/2019 Approved An Ordinance Granting a Variation to Allow the Re-establishment of a Nonconforming Residence in Sycamore Township. O2019-02 01/16/2019 Approved Approval of a Special Use Permit for a Solar Garden for Property Located on the Twombly Road in DeKalb Township. O2019-03 01/16/2019 Approved Approval of a Special Use Permit for a Solar Garden for Property Located on Genoa Road in Kingston Township. O2019-04 01/16/2019 Approved Approval of a Special Use Permit for a Solar Garden for Property Located Genoa Road in Kingston Township. O2019-05 01/16/2019 Approved Approval of a Special Use Permit for a Solar Garden for Property Located on Tower Road in Shabbona Township. O2019-06 01/16/2019 Approved Approval of a Special Use Permit for a Solar Garden for Property Located on Tower Road in Shabbona Township. O2019-07 01/16/2019 Approved Approval of a Special Use Permit for a Solar Garden for Property Located on Council Road in Somonauk Township. O2019-08 01/16/2019 Approved Approval of a Special Use Permit for a Solar Garden for Property Located on East North Avenue in Cortland Township. O2019-09 01/16/2019 Approved Approval of a Special Use Permit for a Solar Garden for Property Located on East North Avenue in Cortland Township. O2019-10 01/16/2019 Approved Approval of a Special Use Permit for a Solar Farm for Property Located on Preserve Road in Clinton Township. O2019-11 01/16/2019 Approved Approval of a Special Use Permit for a Solar Garden for Property Located on Crego Road in Afton Township. O2019-12 01/16/2019 Approved Approval of a Special Use Permit for a Solar Garden for Property Located on Crego Road in Afton Township. O2019-13 01/16/2019 Sent Back to Committee Approval of a Special Use Permit for a Solar Garden for Property Located on Bethany Road in Cortland Township. O2019-14 01/16/2019 Sent Back to Committee Approval of a Special Use Permit for a Solar Garden for Property Located on Bethany Road in Cortland Township. O2019-15 01/16/2019 Approved Approval of a Special Use Permit for a Solar Garden for Property Located on Preserve Road in Shabbona Township. O2019-16 01/16/2019 Approved Approval of a Special Use Permit for a Solar Garden for Property Located on Preserve Road in Shabbona Township. O2019-17 01/16/2019 Approved Approval of a Special Use Permit for a Solar Garden for Property Located on Wolf Road in Kingston Township. O2019-18 01/16/2019 Approved Approval of a Special Use Permit for a Solar Garden for Property Located on Wolf Road in Kingston Township. O2019-19 01/16/2019 Approved Approval of a Special Use Permit for a Solar Garden for Property Located on Somonauk Road in Somonauk and Sandwich Townships. O2019-20 01/16/2019 Approved Approval of a Special Use Permit for a Solar Garden for Property Located on Larson Road in Cortland Township. O2019-21 01/16/2019 Approved Approval of a Special Use Permit for a Solar Garden for Property Located on Larson Road in Cortland Township. O2019-13 02/11/2019 Approved Approval of a Special Use Permit for a Solar Garden for Property Located on Bethany Road in Cortland Township. O2019-14 02/11/2019 Approved Approval of a Special Use Permit for a Solar Garden for Property Located on Bethany Road in Cortland Township. O2019-22 02/11/2019 Approved Approval of a Special Use Permit for a Solar Garden for Property Located on State Route 72 in Franklin Township. O2019-23 02/11/2019 Approved Approval of a Special Use Permit for a Solar Garden for Property Located on State Route 72 in Franklin Township. O2019-24 02/11/2019 Approved Approval of a Special Use Permit for a Solar Garden for Property Located on Somonauk Road in Squaw Grove Township. O2019-25 02/11/2019 Approved Approval of a Special Use Permit for a Solar Garden for Property Located on Somonauk Road in Squaw Grove Township. O2019-26 02/20/2019 Approved An Ordinance Granting a Cable Franchise to CMN-RUS, Inc.
O2019-27 03/20/2019 Approved Approval of an Ordinance Designating the Executive Committee as the Body to Determine the Initiation, Settlement, Compromise and Appeal of Litigation on Behalf of the County of DeKalb, Illinois. 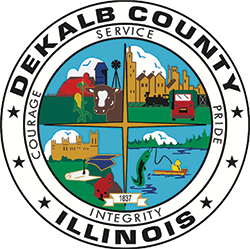 O2019-28 03/20/2019 Approved Approval of an Ordinance Amending Chapter 2 of the DeKalb County Code. O2019-29 04/17/2019 Approved Establishment of Altered Speed Zone for Esmond Road in South Grove Road District and East Sandwich Road in Squaw Grove Road District. O2019-30 04/17/2019 Approved Public Transportation Applicant Ordinance.